In 2009, the National Athletic Trainers' Association released Preseason Heat-Acclimatization Guidelines for Secondary School Athletics to decrease the occurrence of heat illness in high school athletes participating in summer practices. Unfortunately, it wasn't until after the nation experienced "the worst week in the last 35 years in terms of athlete deaths" that states began mandating the adoption of these guidelines. In summer of 2011, three heat-related deaths were reported on high school football fields, four Arkansas football players were hospitalized for dehydration, and an endurance runner died of apparent heatstroke during a race called the Warrior Dash. According to a study by Andrew J. Grundstein, an associate professor in the department of geography at the University of Georgia, the annual death rate was around one per year from 1980 to 1994 but rose to a yearly average of 2.8 in the next 15 years. In the past, simply scheduling summer practices for early morning and/or evening would be enough to avoid the highest temperatures of summer and reduce the risk of heat illness. However, according to Grundstein, morning temperatures are higher than they were decades ago. Additionally, high school athletes are bigger than they were decades ago. According to Douglas J. Casa, chief operating officer of the Korey Stringer Institute, a nonprofit dedicated to preventing sudden death in sports, "You have 300-pound high school guys walking out to practice and you have no medical staff and they're going six hours in 100-degree temperatures." 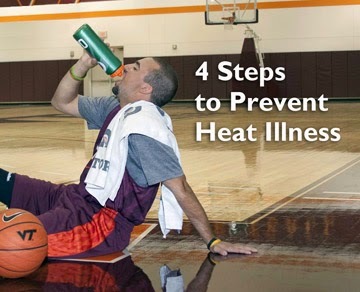 Follow the 14-day heat-acclimatization period recommended by the NATA. Use a Wet Bulb Globe Temperature Meter (WBGT) — not the heat index — when assessing whether practice conditions are safe. The WBGT index is the most widely used and accepted way to assess heat stress in the United States, but getting coaches to move away from their reliance on the heat index is a challenge. Have an athletic trainer present during all practices and games. May 2011 - New Jersey State Interscholastic Athletic Association becomes first state organization to adopt heat-acclimatization guidelines. 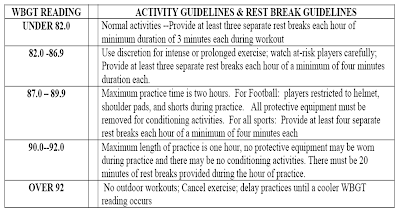 October 2011 - the University Interscholastic League in Texas bans two-a-days for the first four days of training camp and on consecutive days thereafter. State high school activity associations in Arkansas, Connecticut, North Carolina and Georgia follows suit, with Georgia instituting fines of up to $1,000 for school found in violation of their heat acclimatization mandate. Fifteen other state high school associations are actively considering adoption.